As we've reported in recent weeks, Monster Hunter 4 has been achieving particularly impressive sales since its launch in Japan, moving quickly towards Capcom's targets. The company had anticipated 2.8 million sales by the end of March 2014, yet has now confirmed that the title has already surpassed three million sales at physical retail and through download codes / direct eShop purchases. Those are seriously impressive numbers, with Capcom also stating that the franchise as a whole has now gone past 26 million sales. Next year will also bring the 10th Anniversary of the series, so in our deepest held dreams we hope that the landmark will be accompanied by a high profile release of Monster Hunter 4 outside of Japan — time will tell. These sales are apparently a record for a 3rd-party 3DS game in Japan, which is not only terrific news for Capcom but the wider platform, as it demonstrates the enthusiasm of the portable's growing install base. 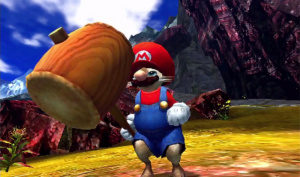 We hope to hear of localisation soon, but in the meantime don't forget to watch us play through the opening 30 minutes of Monster Hunter 4; we'll post more videos of the game in the coming weeks. @MadAussieBloke sign me up for superior wii u version please! @darkev9001 It's possible that there could be a WiiU version coming, just like Monster Hunter 3 Ultimate, which was originally for 3DS. I couldn't go back to the 3DS after playing Ultimate on my tv. Wasn't Capcon the one that was really short on cash? Nintendo need to get this on Wii U, the more "must have" exclusive 3rd party games the better. A Wii U port would be better, this looks a little too intense for the 3DS. But we take what they give us. They can co-produce and release both to the West like they did with 3U. They already raked in more profits than expected. @Amin_and_Azizah Based on what? Did the Wii U version of Ultimate sell well enough? I think this is Capcom we're talking about here. If we've learned anything they will bring out 4 on the 3ds first and milk the money before even announcing a Wii U version if at all! Im sure for now they're perfectly happy with only the 3ds version! Wii U version pls thank you in advance! I don't see a Wii U version coming for this game, maybe the next Monster Hunter will show up on it, but not this one. Just got Monster Hunter 3 for my 3ds two weeks ago to play w/a group at work. As a multiplayer game I'm really enjoying it! Maybe they keep mentioning the March checkpoint of sorts, because if it sells like crazy (as it has and will) by then, they'll announce it over this-a-way. Fingers crossed, guys. Guess ill just go back to youtube to watch more videos and dream. Its funny how the WiiU is being talked as superior. I understand it's just an opinion , but I fail to see what makes it superior. @Jono97 Don't think so. The none Jap parts were (And are not) not performing but spending loads. Think they have always been ok taken as a whole. A pre order if it comes to the Wii U. While a WiiU version would be nice, I don't see it coming at all. WiiU sales in general are still lacking, and releasing an HD version at this point would hurt Capcom more than it benefits them (since the MH4 has full online capabilities anyway). @Nintenjoe64 While I love Xenoblade (It rotates between it and Link to the Past as my fav game ever) and Monster Hunter, they are not the same genre. MH is a action game with mmo/grinding elements. Xenoblade is a full on RPG. mh4 is sure selling like crazy in japan!! and now with pokemon x & y going 4 million worldwide, thats huge!! !